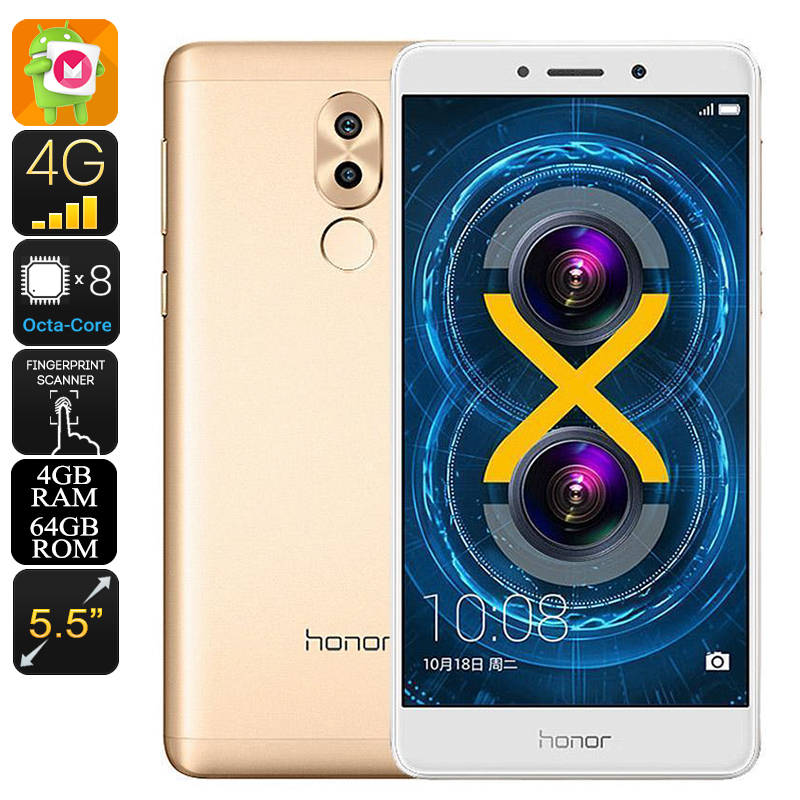 Successfully Added Huawei Honor 6x Android Phone - 5.5 Inch Display, Dual-IMEI, 4G, Fingerprint, Android 6.0, Dual-Camera, Octa-Core CPU (Gold) to your Shopping Cart. Meet the Huawei Honor 6x, a sophisticated Android phone that delivers an exceptionally smooth yet powerful performance. Running on an Android 6.0 operating system, it will treat you with an abundance of software features that are guaranteed to significantly increase your overall user experience. With its metal body and sleek look, this Android mobile phone features a high-end design that is fit for any flagship device out there. Packed within its thin body, lays a stunning 5.5-Inch display that delivers 1080p Full-HD visuals - allowing you to enjoy all your favorite movies, games, and apps to their absolute most. Featuring the latest IPS technology, this Chinese smartphone provides vivid color and stunning detail – truly enhancing your mobile media and entertainment experience. Within its sleek body, this Huawei phone packs an Octa-Core CPU that has been clocked at 2.1Ghz. Combined with the phone’s 4GB RAM, this powerful processor lets you engage in excessive multitasking sessions and enjoy the latest mobile entertainment without dropping a frame. Holding 64GB of internal memory and supporting a 128 SD card slot, this Chinese Android smartphone always offers the space necessary for you to store all your files and media alike. At the rear of this beautiful Android mobile phone, you will be able to find a stunning 12MP dual-camera that lets you shoot absolutely breathtaking photos and 1080p video of all those special moments in life. Below its exceptional camera, you will be able to find an ultra-fast fingerprint scanner that brings along great security and efficiency. No longer will there be the need to remember passwords or annoying unlocking codes – from now on you’ll gain access to all your personal files and media with the simple touch of a finger. As most high-end Dual-SIM phones, this mobile phone supports two IMEI numbers through which it allows you to be reachable on two number while using just one device. Additionally, this smartphone also supports 4G connectivity – providing you with the fastest data speeds out there. Whether you’re at home, in the office, or enjoying a cup of coffee in the city – with this Android phone at your side, you’ll always be connected. With its powerful 3340mAh battery, it lets you enjoy all your phone has to offer for up to 5 hours continuously – enough to get through the day without needing to worry about battery life. The Huawei Honor 6x comes with a 12 months warranty, brought to you by the leader in electronic devices as well as wholesale electronic gadgets..
Arabic: - الروبوت الهاتف - Chinese Simplified: - Android 手机 - Czech: - Android telefon - Danish: - Android-telefon - Dutch: - Android telefoon - French: - Téléphone Android - German: - Android-Handy - Hebrew: - טלפון אנדרואיד - Hindi: - एंड्रॉयड फोन - Italian: - Telefono Android - Japanese: - Android の携帯電話 - Korean: - 안 드 로이드 전화 - Malay: - Telefon Android - Norwegian Bokmål: - Android telefon - Romanian: - Telefon Android - Russian: - Телефон Android - Spanish: - Teléfono Android - Thai: - โทรศัพท์มือถือ - Turkish: - Android telefon - Vietnamese: - Điện thoại Android.